Bug 279602. Add SVN Locks view which shows SVN locks and provides corresponding actions such as Lock, Unlock, Break Lock. Bug 295079. As authorization database is superseded by the Equinox secure storage, store secure data in Secure Storage. It was deleted obsolete Password Management page in SVN preferences, instead of it you can manage the list of passwords that have been saved via Secure Storage preference page. On first running of Subversive with Secure Storage support, secure data is automatically migrated from Authorization database, so you don't need to reenter it manually. Bug 288139. 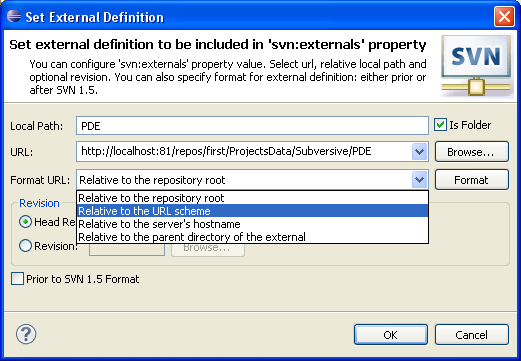 This dialog provides an ability to set external definition information to be added to a svn:externals property of the selected resource. It adds ability to make relative urls. Bug 290386. Handle resources in external definitions as normal resources, especially it concerns to complex cases of defining externals, e.g. in commit, revert actions, decoration, Synchronize view. Bug 292280. When you add revision link there's ability to specify comment for it; revision link can also be modified(revision and comment). It was changed a little revision links presentation. 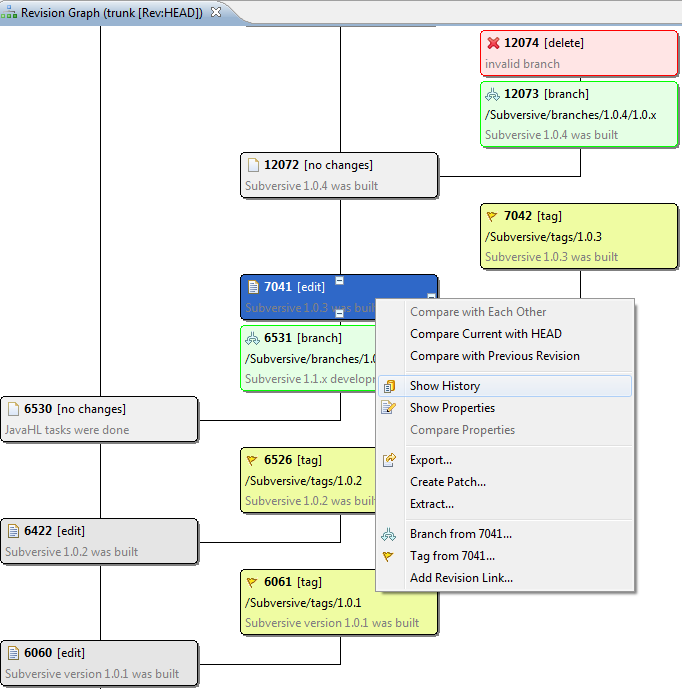 For instance, you can use revision links when switching between trunk and branches by saving revision. Bug 293016. Separate text and properties status. Previously there was only State property, but it wasn't possible to know from it what exactly and how was modified content or property, e.g. they can be modified at the same time. Add other properties, e.g. Copied etc. Bug 211253. SVN Revision Graph is a graphical representation of history for any resource. Using Revision Graph we can see a resource history with copy operation, applied for this resource. Represented information includes information about branches and tags for resource, so it allows to see a revision history for a resource and all its branches and tags. It's a main advantage of the Revision Graph over a History View, because History View is able to display only a history for resource, but not its copies. As the result Revision Graph is very useful in case if branches and tags are used, so users can see the whole picture of resource changes together with all branches and tags, where it was used on the one screen. 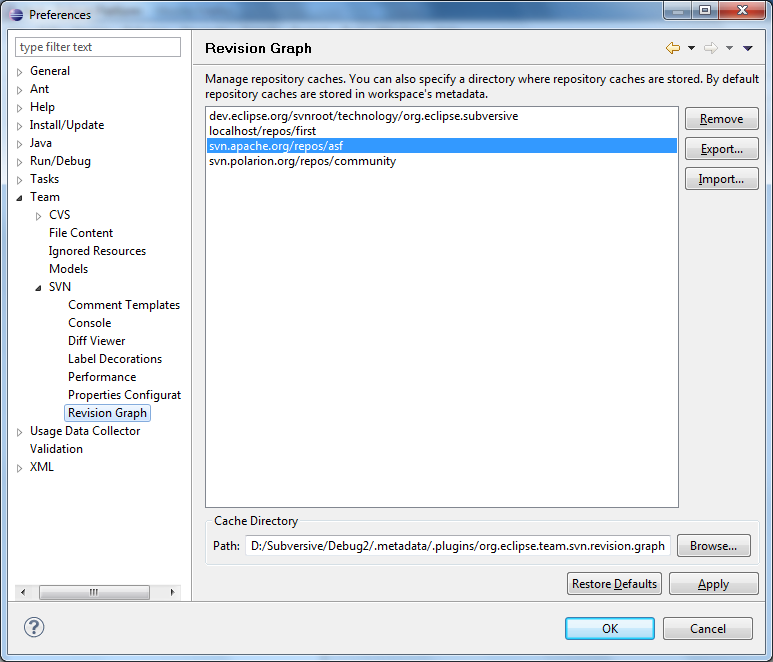 Add preferences for Revision Graph on which you can manage repository caches. You can also specify a directory where repository caches are stored. By default repository caches are stored in workspace's metadata. This page was last modified 04:48, 19 May 2013 by Alexander Gurov. Based on work by Igor Vinnykov.